It’s been a slow season in the apiary as I have only one active hive this year. But you, gentle reader, will be happy to learn that I have used my bee-down-time productively by making enhancements to my entire beekeeping process. My husband is completely embarrassed by my bee-geekery and never more so than when I hung this bracket up in the kitchen. I used one of those little brackets that security cameras are mounted on and instead put my beloved Bushnell PermaFocus bird binoculars on it. 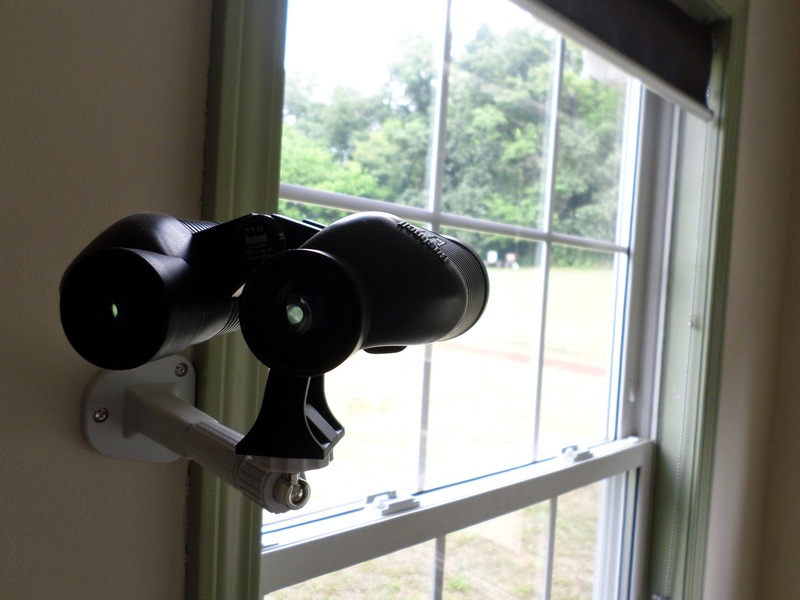 It is mounted next to the window that has a direct view of the apiary. Attached to the white camera bracket arm is an upright black tripod mount made for cameras and binoculars. This tripod mount holds the optics up and off of the arm bracket. And what do I see on the 50,000 times a day I check on the bees? 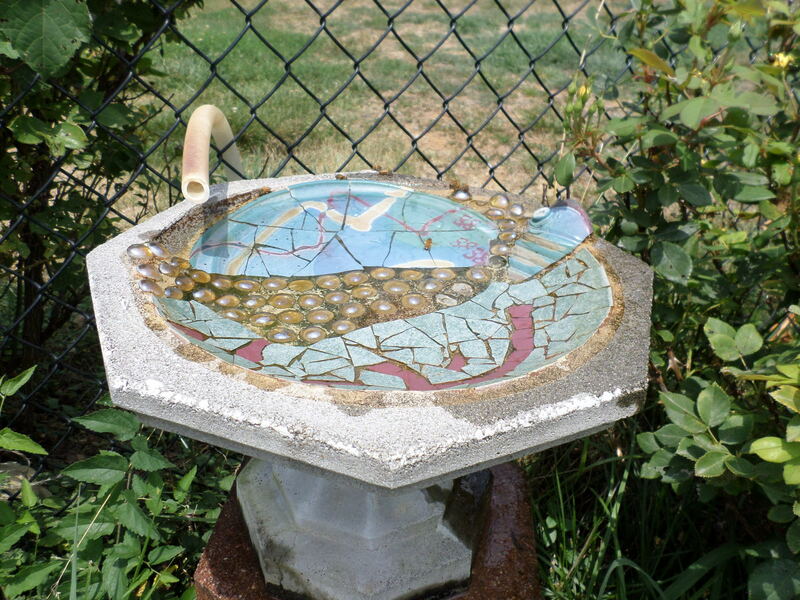 What began as a birdbath proved to be a major benefit for bees: a source of fresh water. I attached a clear plastic hose line (I bought it at Lowe’s, cut to fit) from the condensate drain line on my air conditioner and ran it to my bird bath. I attached the hose line to the chain link fence with (what else?) cable ties so that the water from the hose would splash down into the birdbath. The birds, of course, love it. 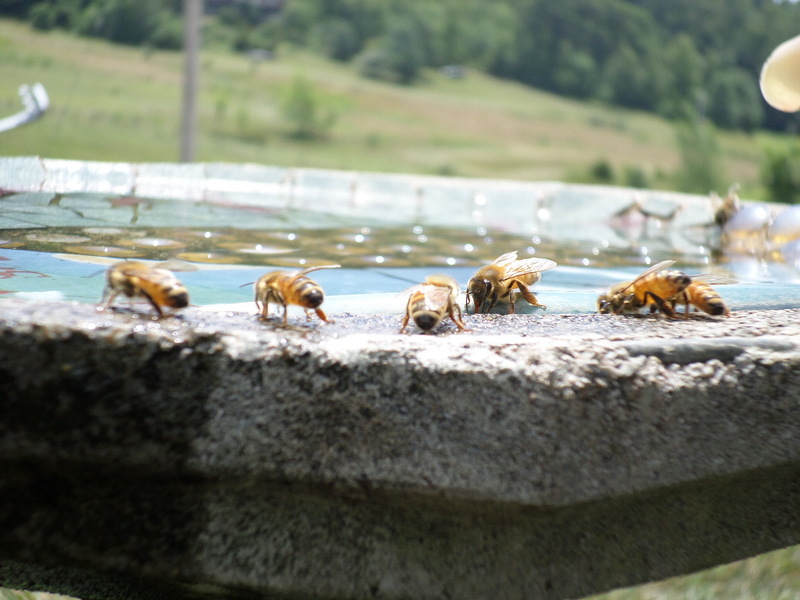 But the bees really flock to it and it is not uncommon to see a dozen at the birdbath in really hot dry weather. The big bonus here is that on the super-hot days when your AC runs all day the birdbath stays filled with fresh clean cool water and everyone — birds, bees, and you — benefits. The condensate drain line is hanging over the birdbath (on upper left of photo). This is a shallow bath which helps keep the bees from drowning; I also have it slanted slightly so that the water drains freely. The bees prefer to drink from this “runoff” area. It’s like the public pool on a hot summer day. See the little bee in the background on the right? She is dipping her little tongue down in the water with her wings up (I assume for balance). This tip is probably only useful for small-scale beekeepers like me who use entrance feeders instead of hive-top feeders. I make up several quart jars of pre-measured sugar but I don’t fill them with water until just before I need them. 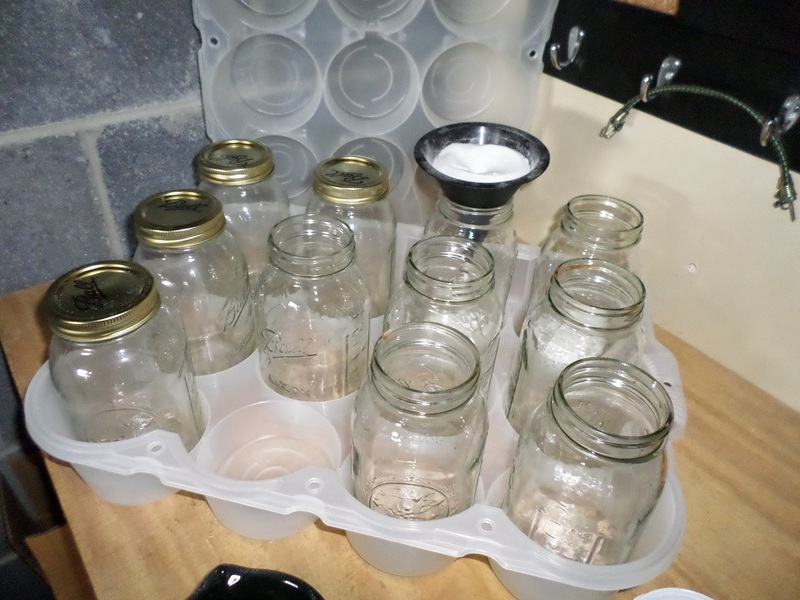 To keep ants and other unsavory characters out of my bee sugar I put all the jars, measuring cup, and funnel into one of these canning containers called The Jar Box. The lid snaps in place with little locks on either side. Sugar-filling in process. This Jar Box keeps the sugar contained and prevents spills and the residual stickiness. Beekeepers have tools that make the job of opening hives and caring for bees easier. 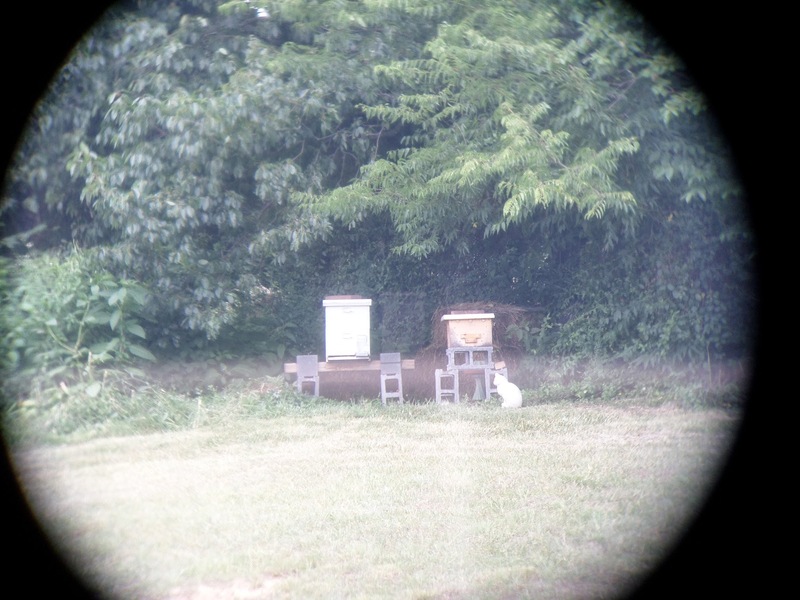 The trick is to have all of these tools handy at all of your hives as your attention is most likely divided between 1) an active and very hot smoker, and 2) several thousand honeybees. This is where a standard grooming tote comes in. I got this tote at the farm store as it is intended for storing the tons of grooming supplies needed for just one horse. It is great and should not be limited to barn use. I put my hive tool, brush, smoker fuel, and butane lighter in here. There is more room for an extra pair of gloves, a camera, or a few other tools. This tote helps you hold all the tools in one gloved hand so that you can hold your very hot, lit smoker (pictured to the right of the tote) in the other hand. 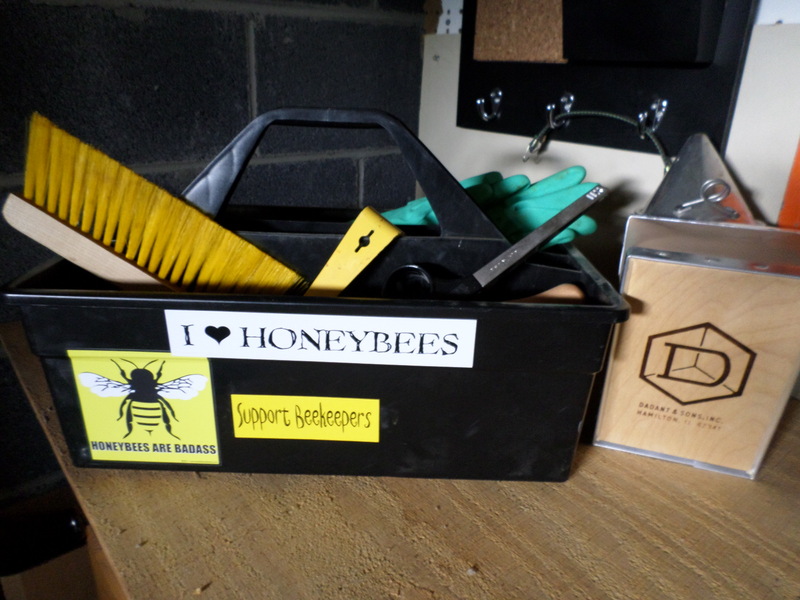 The tote also sports my collection of awesome beekeeping stickers. 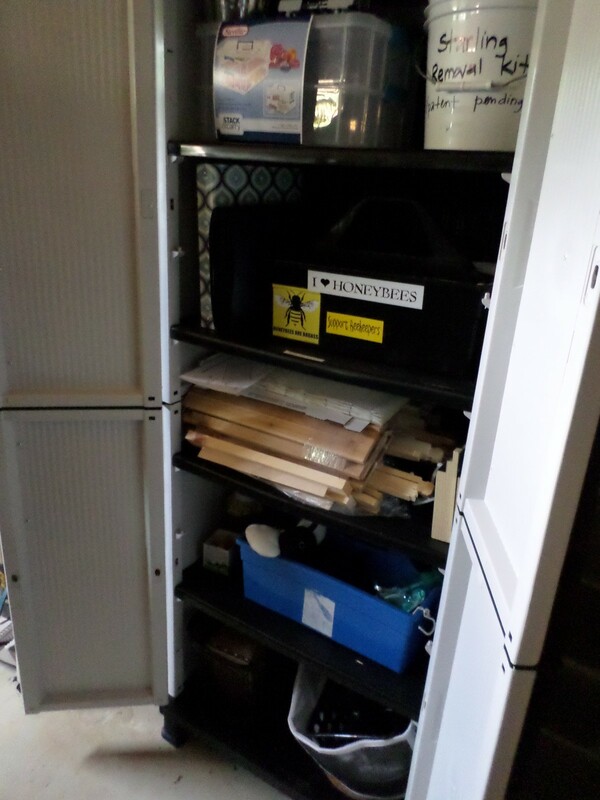 Bonus photo: I have a dedicated corner of the garage for beekeeping supplies, and in this cabinet I keep my tool totes, extra frames and foundation, my cooled (and smelly) smoker, an extra veil, extra feeders, etc. It is good to store wax foundation away from the prying eyes and gnawing teeth of rodents.